We all know there are some vicious ants in the world, and when their colonies become super-large, ants can go to battle with just about any type of insect, no matter how large. This is why ants are so important to the abundance of plant life in the Amazon rainforest. As you know, the Amazon rainforest is full of herbivore insects that constantly threaten the lives of plants. Obviously plants cannot move, so how do they defend themselves in an environment shared by numerous species of herbivore insects? Well, ants, of course. It turns out that plants offer ants shelter, and in return, ants protect plants from herbivore insects, both large and small. Researchers recently discovered that ants are called on for protection duty when two particular genes in the ant are expressed. Researchers focused on a common plant found in the Amazon rainforest. This plant is referred to as Cordia nodosa (CN). These CN plants are clearly protected by a particular type of Amazonian ant that is referred to as Allomerus octoarticulatus (AO). This plant species and this ant species support one another, since the plants shelter the ants and the ants stand up to insects that are looking to consume the plants. The ants are like bodyguards to the plants. The plants act as a safe haven for ants by obscuring the ants from predators. 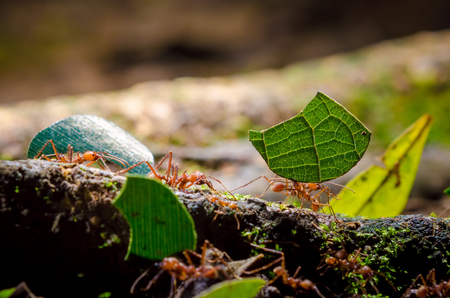 When different animals benefit one another in nature, the phenomena is known aptly as “mutualism.” The ant/plant relationship being described in this blog is certainly not rare in nature. In fact, over four hundred species of tropical plants have developed structures called “domatia,” which can house ant colonies that defend the plants. According to researchers, domatia likely developed over the course of evolution because it had attracted ants, which always kept dangerous herbivore insects away. These ants seem to be the only protection from herbivores that plants have. The researchers focused on two particular ant genes involved in foraging. The way an ant forages for food determines protective behavior towards plants. When the two genes were activated, the ants became vicious warriors, and were willing to attack the largest of insect herbivores, which resulted in less damage to the plant. The genes also led to more ant workers being recruited to fight, and the ants were better able to locate and kill herbivore enemies. This study was able to account for mutualism on an chemical level. Do you think that these plants release chemicals that influence the ants’ foraging genes?